This article explores how Primary Years Programme (PYP) students took ownership of the Model United Nations (MUN) experience with their ‘How we organize ourselves’ unit. 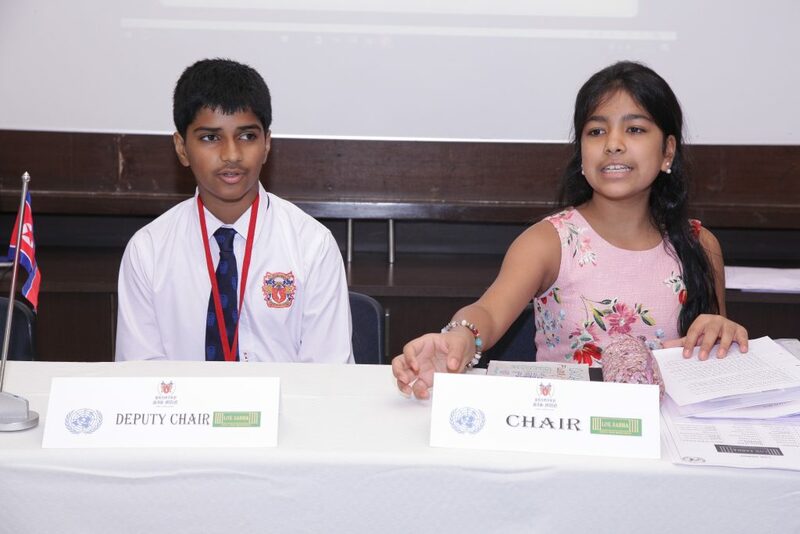 Inspired and empowered by the senior students and seeing their leadership in the MUN events, PYP students planned and hosted their first ever inter school MUN. An exciting idea germinated in the PYP classroom through the discussions emerging from inquiries into the unit How we organize ourselves. Student leaders, who were actively engaged in participating in and hosting Model United Nations (MUN) conferences, gave birth to the first ever Primary Singapore International School (SIS) MUN at our school. ‘MUN-ing’ has been a part of our school character strengthening through the IDEALS* of Internationalism, Democracy, Leadership and Service, and the attributes of the IB learner profile. For their unit of inquiry with the central idea People create organizations to solve problems and support human endeavor, our grade 6 students had been taking part in our school MUNs as observers and conducting intra-class Mock MUN sessions over the last two years. They enjoyed their learning engagements thoroughly and though it was never a requirement or a norm, they decided to take this experience one notch higher and plan and implement an innovative event. Even though this would be their first experience with a primary MUN, they took on the challenge to be the organizer and host, and invited their peers from grade 5 to become the actual delegates. Thus, the culture of student leadership that was already a part of the school ethos enabled learners to take charge of their own learning and make important decisions about the same. The primary SISMUN was planned as an inter-school conference. With the guidance of the senior school students and adult mentors, the students planned it modestly, keeping the spirit of the PYP at the core of the issues. The pedagogical leadership team helped them choose committees to ensure that the issues were from local (Lok Sabha) to regional (South Asian Association for Regional Cooperation) to global (UNICEF and UNHCR). Similarly, the issues would find resonance in their learning from the themes of Who we are (child labour), Sharing the planet and Where we are in place and time (migration due to war), How we organize ourselves (common currency) and How we express ourselves (arts education), thereby blending and synthesizing components of the PYP curriculum. The Primary SISMUN was held in April 2017 with participation from 4 other primary IB World Schools from Mumbai and Pune. The conviction of the students, backed by the willingness of the pedagogical leadership team, inspired other schools from the network and beyond to participate in this event. Our grade 6 students put on an impressive opening ceremony and more importantly displayed confidence and conviction as members of the Organizing Committee. We had a Skype interaction with a young CEO from India, selected as one of the top 50 youth initiative based solutions for sustainability by the UN for his startup company, Tyrelessly. Our delegates from grade 5 adeptly debated, discussed and resolved issues with professional ease and maturity. This also resulted in some exciting press coverage. We were delighted to see our PYP students’ achievement in terms of thinking and communication skills, confidence and enthusiasm and being open-minded and courageous, and we hope that they continue to apply their knowledge, conceptual understandings, skills, attitudes and attributes to take meaningful action that will make a difference to the world we live in. Above all, this experience created a domino effect of inspiration and agency in the school community, during the PYP exhibition, and in the planning of the coming year’s edition of the Primary SISMUN. In its mission statement, the IB aims to “develop inquiring, knowledgeable and caring young people who help to create a better and more peaceful world through intercultural understanding and respect.” The Primary SIS Model United Nations became an effective platform for students to put this mission into practice. Abhimanyu Das Gupta has been an IB practitioner since the last 13 years and has had extensive experience in the PYP at the Pathways School, Aravali, as a home room teacher, grade level coordinator, PYP coordinator and as the Primary School Coordinator. He has been heading the primary division at the Singapore International School, Mumbai since 2014 , inspiring his colleagues to promote learner agency and thereby, empower students. His passion for teaching and learning is evident in the practices he inspires in the learning community. He strives to promote inquiry-based learning for the students and by the students. You can follow him on Twitter @abhimanyudg77. Action component has been displayed well by students. Thank you for sharing this inquiry.